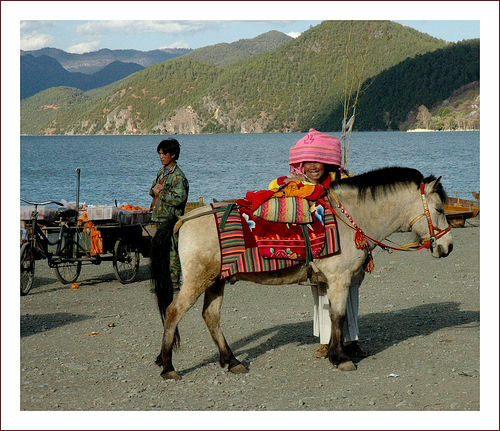 This is quite a pretty pony, from the area near Lugu Lake, in the Yunnan region of China. The area is home to an ethnic minority called the Mosou, most renowned for their unusual marriage practices. 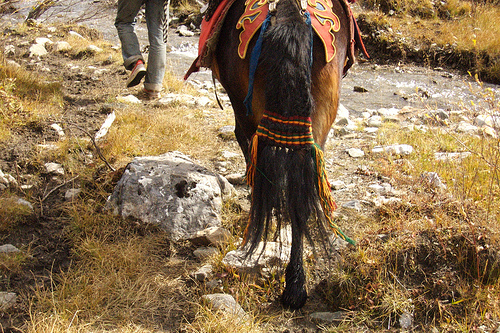 This dun-colored pony has the stocky build and low-set neck typical of the mountain ponies of the Himalayas and Mongolia. The cheerful red bridle and multicolored saddle cloths are delightful. Like other Himalayan area bridles, this one is made of woven fabric, not leather. This Tibetan horse's tail is adorned with yarn woven into the tail hair - it doesn't look likely to come out easily, but neither should it interfere much with the usefulness of the tail for swishing flies. The photographer notes that the yarn is used to indicate who owns the horse, thus it is meant to be left in for long periods of time.